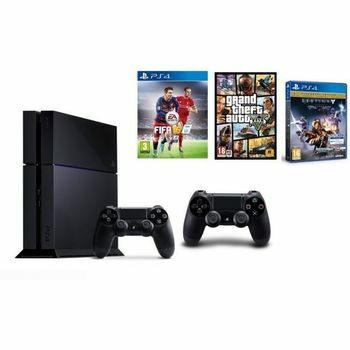 THE SONY PLAYSTATION 4: GO PLAY The much awaited PlayStation 4 offers dynamic, connected gaming, along with high end graphics and speed, intelligent personalization. What it is also packed with is deeply integrated social capabilities, and innovative second-screen features. Fusing unparalleled content, immersive gaming experiences, all your favorite digital entertainment apps, and PlayStation exclusives, the PS4 focuses on all the needs a gamer can have. INSPIRING GAME DESIGN The PlayStation 4 ensures that even the very best games and the most immersive experiences are offered on this ingenious platform. The PS4 system allows the greatest game developers in the gaming world to unleash their creativity and push the boundaries of game design through a system that has been specifically tuned to their needs. The PS4 system has been built around a powerful custom chip that has eight x86-64 cores and the 1.84 TFLOPS graphics processor with 8 GB of ultra-fast GDDR5 unified system memory. These heavy duty features ease game creation and enhance the richness of all supported content. What you get is rich, high-fidelity graphics and and immersive home entertainment experiences.